ATTENTION FARMERS: Increase crop production and pollination by placing any of these bee attractants next to your crop. Keep your bees happy, and keep your crops plentiful! BEE BUZZ! My friend Rian has worked with me at Bosky Dell since he was a young kid. He is now a berry farmer & helps me during his off-season. He learned about bee attractors working with native plants at Bosky Dell and applied that knowledge to increase his crop production. He says the neighboring farms have bee boxes for bees. Rian invested in native bee attractive plants & has integrated them into his fields of berries. 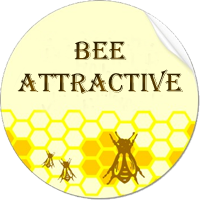 He has much better pollination than the neighboring farms because he knows what it takes to "bee attractive!" The bees may live at the neighboring farms, but they spend their days buzzing their favorite blossoms at Rians. GO NATIVE - BEE HAPPY! Traditionally, advocates of pollinating bees have been separated between those for honey bees and those for non-honey bees. While there has always been strong competition for funding between these two groups, the majority of funding has landed on the honey bee side. As a result, only a handful of the 30,000 non-honey bees found worldwide have received enough serious attention and adequate funding to be developed into domestic crop pollinators. The alkali bee (Nomia melanderiCockerell) and the alfalfa leafcutting bee (Megachile rotundataFabricius) are among the top of the Pacific Northwest list. Because they are highly adapted to the hot, dry alfalfa seed growing climates of eastern Oregon , eastern Washington , and Idaho , these wild bees are far more efficient than honey bee at pollinating alfalfa. On the other hand, these wild bees exhibit a limited forage crop preference and are not adapted to the western climates north of Medford , Oregon . Next to the alkali and alfalfa leafcutting bees, the mason bee species of the genus Osmia have without a doubt undergone more scrutiny than any other wild bee crop or orchard pollinator. Among these bees is the orchard mason bee (Osmia lignaria propinquaCresson) and is found in wooded areas near homes throughout western Oregon and Washington . With their ability to forage on a wide variety of pollen and nectar plants, orchard mason bees are often observed visiting early season fruit tree blossoms. They are commonly recognized for their efficient pollination capabilities and their ability to forage in poor weather conditions. Surprisingly, they are often seen flying and foraging in conditions 3 - 4°F cooler and wetter than honey bees. The orchard mason bee has proven to be an effective pollinator in apple, plum, and almond orchards.